1. 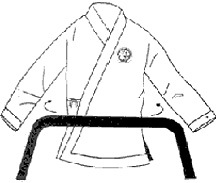 Grasp the center of the belt with both hands. 2. Place the center on your abdomen and carry the belt around your waist by moving the belt ends to the small of your back. 3. Switch the belt ends left to right hand and vice versa. Do not twist the belt. 4. 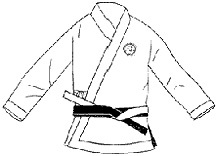 Slide your hands along the belt as you move the ends directly in front of you. 5. 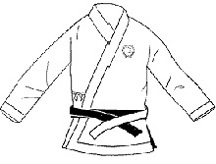 First pull the right side across the front of your body; then cross the left end over the center of the belt. 6. Bring the new right end (the side on top) up under both layers of belt. 7. Tie a square knot, folding the right side over top and pulling the end through. Both ends should hang equally.